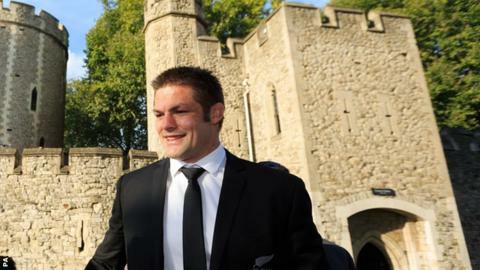 New Zealand captain Richie McCaw is expected to delay any announcement over his international future until after the World Cup. McCaw received an emotional send-off in Auckland last month after the All Blacks beat Australia 41-13 in what was billed as his last home international. "I haven't made a final decision yet although I've given a reasonably strong hint," said 34-year-old McCaw. "Whether I play much more past this year is pretty debatable." McCaw is the most capped player in test history and a three-time winner of the world player of the year award. "The reason I haven't (made any announcement) is I really wanted to play in this tournament, like you would any other year as if you were going to play on," he added. "With the door still being open, that decision is going to be made later. But I want to make sure that when I turn up for training, I train to be better than I was the week before." McCaw captained the All Blacks to victory in the last World Cup and his side will start the defence of their crown against Argentina at Wembley on Sunday. New Zealand are strong favourites to win the tournament and McCaw aims to use the expectation in a positive way. "That type of expectation is what has driven the All Blacks to keep training hard and to give of their best," he said. "It can be rough at times but that is just part of being an All Black. I'd hate for that to change. That's what you want. You want to go out and win every game. "You want to do everything right so that you can give yourself a chance."